Vegetables you haven’t heard of: Okra – am I right? 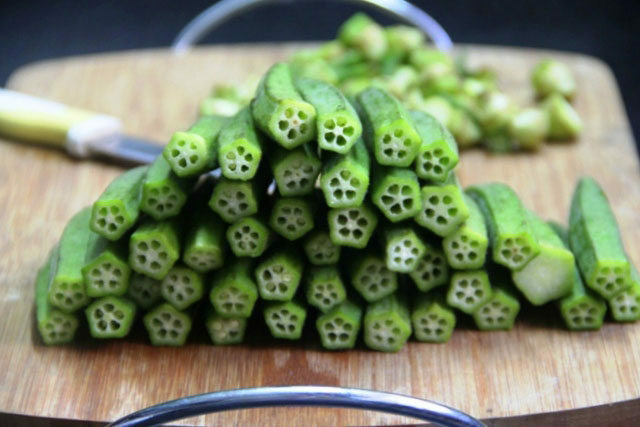 Okra is relatively unknown to the masses and the mainstream ‘healthy eaters’. The ones who think healthy eating is a bowl of processed muesli with skimmed milk. Ask them what Okra is and they’d probably say anything from an animal to a spiritual practice. Okra is actually my favourite vegetable. Yes, such categories do exist! I’ve been asked about Okra almost every time I’ve purchased it, hence I want to share the ‘secret’. OK cool, so what is Okra and where’s it from?! Okra is a tropical and sub-tropically grown vegetable that’s popular in Japan and South Asia. It is available all over the world though. Even in the U.K. it’s present in most supermarkets and fruit and veg stores. Awesome. What does it taste like? This is the million dollar question I’m asked perpetually. How it tastes depends on how you cook it, and how long you cook it. If you stir-fry it, it’ll taste rather crunchy. Steaming and boiling will soften it up nicely and will give it a texture that melts in the mouth. I personally think it resembles Broccoli most – subject to how the Broccoli is cooked of course. Interesting. How do I go about preparing and cooking it? I top and tail it (remove each end) and either cook it in it’s full length or chop it into smaller chunks. It all depends on the cooking method. If steaming or stir-frying, I recommend chopping it into small pieces. If boiling, leave it full length. I’ve heard of people deep frying it too. That doesn’t turn me on too much though I’m afraid. To steam, it takes around 7 minutes (much like Broccoli and Cauliflower) to reach a nice, soft state. This is the cooking method I use most. You’re winning me over slowly. What will Okra offer me nutritionally? Like all green vegetables, Okra is a supreme source of insoluble fibre. In addition, it offers up a generous serving of potassium, calcium and vitamin C – to name a few. It also has folate, manganese and the much lacking vitamin K and magnesium. We can – at the very least – call it nutrient dense! Okra is very versatile too. It mixes extremely well with a plethora of foods, from salads to stir fry dishes. Not to mention it adds an often lacking colour to your dinner plate; dark green. Okra is slightly pricier than some vegetables, but it’s a price worth paying if you ask me. Ironically, it didn’t make my top 10 countdown of fruits and vegetables to start eating………a list I think is in need of some revision. Although I could theoretically list hundreds of fruits and vegetables I personally love. Okra, give it a try. At the very least you’ll have some intrigued folks ask you about it whenever you pick it up. That I can promise. Plus, it isn’t so ‘hate it or love it’ as say Brussels Sprouts. If you like Broccoli, you’ll like Okra. Maybe I should have compacted the entire post into that last sentence? Next Next post: Lifting heavy is only for men? My Dad’s from the south…well, Oklahoma. I know about okra, the fried variety. That’s a recurring theme, knowing Okra as a deep fried dish. In the U.K. people have NO IDEA what it even is…………honest! Slime. That what I think of when I hear the word okra. And fried. I’ve never experienced it not slimy. Perhaps it is more of a southern vegetable (probably their only one!) because I am very surprised to hesr you say it is unknown. I will have to try it lightly cooked, although that is not how my hubby likes it. He likes the slime. Ha, ha, ha. When I was young I was familiar with Fried Okra. I don’t remember eating it. But when I got married my husband said he like okra (not necessarily fried). So one of us bought some frozen. And I cooked it for him. Ewwww. It is so slimy . . . . like dog drool slimy. Perhaps “fresh” isn’t as bad, but . . . . I think if I tried to swallow it, it would slide right back up. I believe that “fried” is a SOUTHERN American thing. We don’t fry everything in California. Also . . . I think it might be an Asian thing . . . as they have A LOT of fried food, too. So . . . I don’t know. What it boils down to is, I have never eating fried okra, because well . . .I don’t need to eat my veggies FRIED . . . and I have not eating it cooked the way my husband likes it because . . . well, if you saw the face I can’t help making while I typing all of this you would know. Ewwww. Straight Talking Fitness Vegetables you haven’t heard of: Okra – am I right?